Ok, today is a little different post. First of all, I did finish the Classic Cardigan, but haven't put on the buttons yet. I did get the buttons yesterday from here, but realized they were too BIG for the buttonholes. After careful consideration and some whining, I figured out that I need to rework the buttonhole band as the button band, and then attach the buttons to the outside and use snaps to actually close the cardi. Smart, huh? It'll be easier than 2-way buttons (a button on the outside and a reverse button on the other, with the hole on the inside-or at least that's what I call it). In any case, that's to be re-knit (I will take pictures before I rip out the buttonhole band, though, I PROMISE!!!!). I finished half of SSKP#2 last night, and started the other half. Pictures to follow soon. Last night, I decided to attempt the toffee again. This time, I had a LOT more success. Here's how I did it WITHOUT a candy thermometer (although I'm sure it would have been much easier with one). Step 1a: Please, I beg you, be sure to grease a sheet pan BEFORE you get started. It's hard enough to pay close attention to the candy as it cooks, without the added distraction of trying to grease a pan. This is an incredibly important step...because if you don't, the candy will stick and it won't break properly, and disaster will ensue. (Well, only for your toffee). See the butter on there? Very important. Step 1: gather your ingredients...I doubled the recipe, so I had 3 and a half sticks of butter, 2 cups of sugar, and 4 tablespoons of water in a large pot. Turn the stove on medium high (on mine, it worked better on around 5-6 than 7...of course I just have one of those weird dials that gives numbers, and not words to gauge your heat). Nice and melty...butter, sugar, how can you go wrong?! Step 2: Get the butter/sugar/water mixture nice and hot, where it starts to melt together and bubble. Step 3: Cook and stir (ALWAYS stir it...it keeps the bubbles IN the pot...very important...this cup runneth over is NOT a happy cup) until it turns brown. 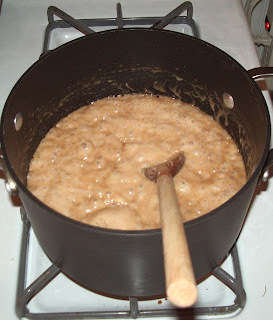 Step 4: Once it gets toffee colored (go figure), add in the 2 teaspoons of vanilla and dash of salt. Of course, any GOOD cook would add only 1 teaspoon...but I added more. 'Cause I'm just like that...a punk. Step 5: Stir well, and pour onto the prepared pan. And let it cool. Once it's cool (mine took about 2-2 and a half hours before it hardened), it's time for some fun! It's smash-time! See all the yummy crunchy toffee goodness just begging to be eaten?! It's a yummy treat. Now, this weekend, I'll be attempting to make the Starbucks "Health Bars", patent pending. :) I also have another wondiferous recipe that I'll share hopefully either later today or tomorrow. The good news, it's simple and fairly quick. The bad news, it's TOTALLY addictive (my husband requests it often...a little too often for my own personal tastes, but I'll indulge him while it's still cool enough to turn on the oven, and then he'll have to wait until after summer to enjoy it again). Toffee bits are also very good in oatmeal cookies. And shortbread.